If you’re thinking about making your own wedding bouquet – or a hand-held bouquet for any occasion – but are concerned you won’t be able to hack it, I’m here to tell you to put fear aside and embrace the DIY! Making a bouquet, even a large one, even one for a very fancy affair, is not nearly as difficult as it seems. Truly, the hardest part is standing in front of a refrigerator full of flowers and deciding which ones work best together. Even then, though, I’ve got some tips to make that easier, as well. 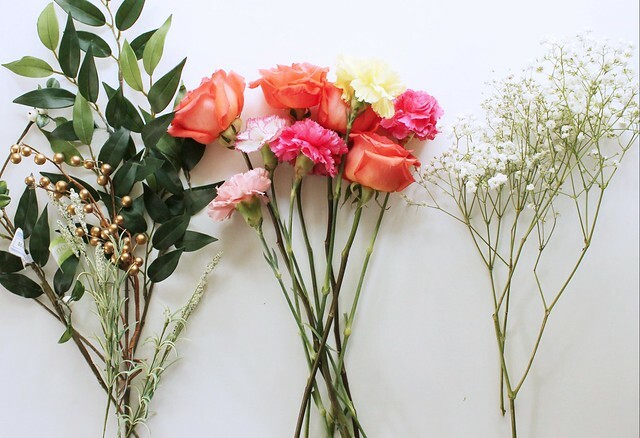 Creating your own bouquet, or having someone in your wedding party make one for you, is so much more cost effective than going to a florist and shelling out at least $200. By making the bouquet yourself, you not only save money, but can really customize it to your tastes. With a few tips, some guidance, and patience, you can design a really gorgeous bouquet and for a price so small, you’ll feel like you got away with something really sneaky! I recently created a gorgeous bouquet for my friend Charlotte’s wedding (above) and while it was far easier than I anticipated and came together really beautifully, my nerves were sky-high leading up to making it and throughout the process. Of course they were though, right? It’s a big job, and an important one, but also totally overrated in its presumed difficulty. You’ve got this! Because I was focused hard on creating a beautiful bouquet, I didn’t enlist anyone’s help in taking photos throughout its construction. Curses! 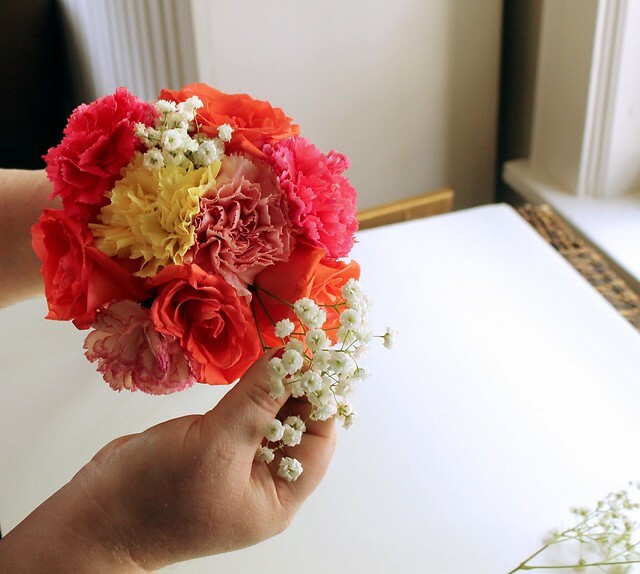 Fortunately, though, there were leftover flowers and the next day, I recreated a smaller version of Charlotte’s bouquet in order to lead you through the crafting of your own with some step-by-step instructions and photos. If you’re looking to make a larger bouquet, I’ll note in the tutorial where and how to continue adding flowers to make a very full, formal one like hers. At the end, I’ll also organize a list of some tips I figured out along the way. I promise you that the hype – and expense! – of bouquets isn’t justified. With some patience and some know-how, anyone can make a stunning bouquet for any kind of special day. The first thing you’ll want to do is select what flowers you’re going to use in your bouquet. Consider the head – or flowered section – of the bouquet as needing three distinct kinds of flowers – 1) those that make up the bulk of the head (this can be one or several different kinds of flowers), 2) those that give the bouquet some height or dimension, and 3) those that can be used as filler to bulk a section up or add some contrast. I chose to incorporate some bay leaf in this bouquet to create height and dimension to my bulk flowers – roses & carnations – and, if you look really closely, you might be able to tell that they’re artificial! For filler and stems, fake sprigs can add a lot of variety and drama for very little money. To prepare your flowers for the bouquet, remove all fresh leaves and thorns below each flower’s head and cut all stems on a 45 degree angle while under running water, then plunge immediately into a vase filled with room temperature water. Cutting the stems under water prevents an air pocket from immediately forming at the cut site, which will interfere with the flowers being able to take in as much water as they need; this is an especially important step when working with roses. As you work, keep your flowers in water and in a cool spot. The first step to making a sturdy, tight bouquet is to build a solid base. As a foundation, this initial group of flowers will keep the center of the bouquet together, creating a strong neck by which to hold it. The base is important because it will be what you build out from in order to grow the bouquet to the size of your choosing. Create the base by pairing 4-5 flowers together in the pattern or arrangement that you like. Starting with the first flower in one hand, imagine it as the very middle of the bouquet. 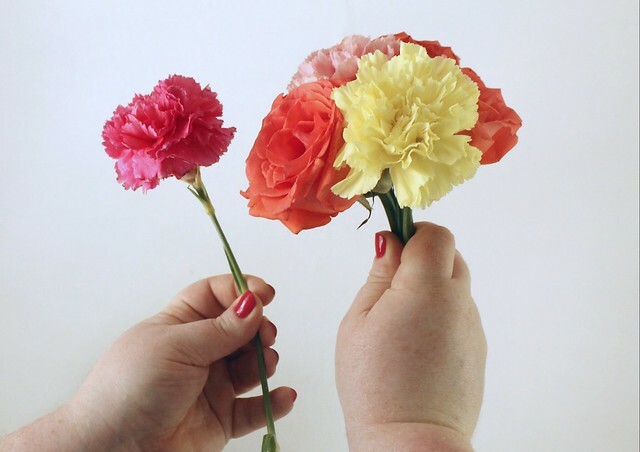 Add your second flower and hold the two tightly pinched between your forefinger and thumb, adding the third, fourth, and possibly fifth flowers in the same way, keeping them tightly gathered beneath the heads of the blooms. Don’t worry if, at this point, the stems are all pointing in awkward directions. 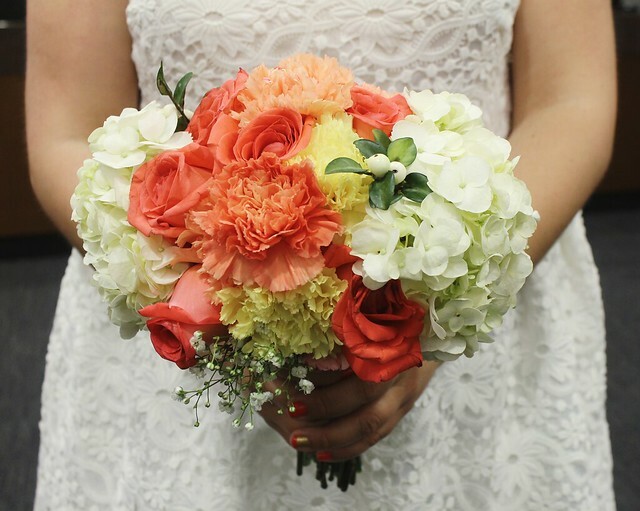 All you want to be certain of is that the top of the flowers appears the way you’d like the middle of the bouquet to look and that the flowers are being held together tightly right below the heads. 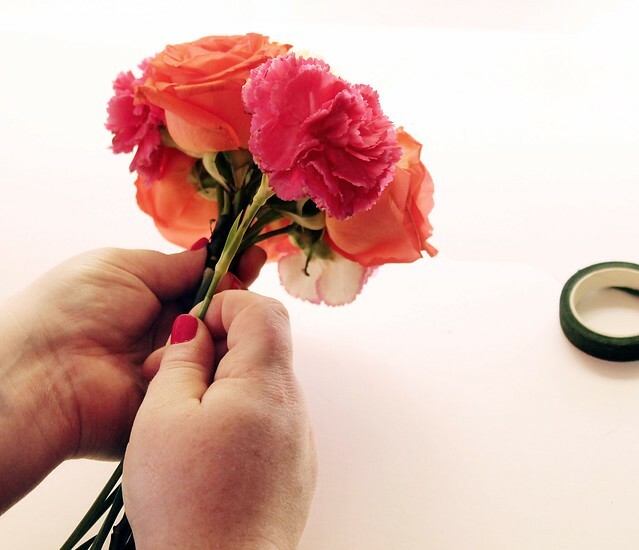 Next, apply the end of a roll of floral tape no further than an inch below the flower heads and, while holding the stems tightly together, wrap down the gathered stems about two inches. 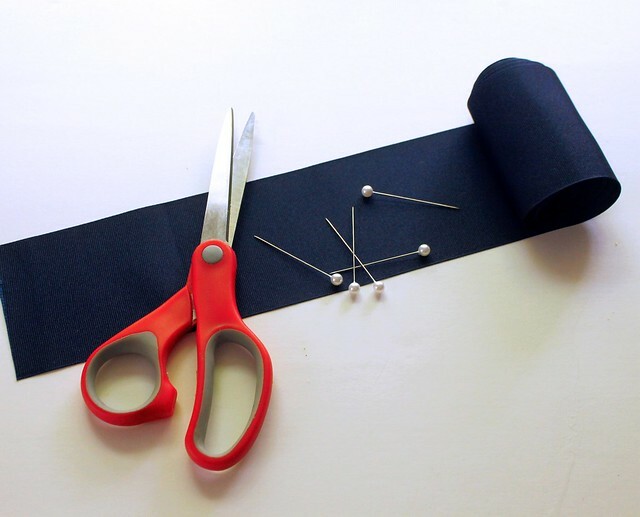 The tape doesn’t have to be perfectly wrapped or look very neat – you’re going to be adding more flowers and then ribbon to cover it all – it just has to be tightly wound, keeping your base very solidly together. Once your base is solidly clustered and taped, the next step is to continue widening and building out the head of your bouquet. Here’s where you decide how big you want the bouquet and can continue adding concurrent layers of flowers accordingly to get the shape and size that you want. Employ the same tactics as above, adding and pinching the new flowers one-by-one around your base, holding them tightly. 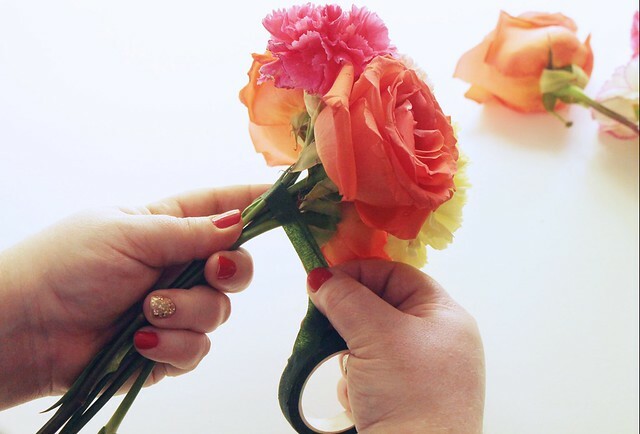 A loosely held bouquet will shift and appear sloppy, so keep those stems tight and, as needed, apply more floral tape to keep everything sturdy. If you’re working with a mixture of different flower sizes – for example, in Charlotte’s bouquet, I used roses, carnations, and then large, white hydrangeas – consider symmetry when in doubt about how to further arrange the growing layers. Balancing one large flower on either side and then filling in the two remaining sides with similar, smaller flowers will keep the bouquet round and voluminous. If you don’t like how something looks, rearrange things. Nothing is set until you tape the final bunch and even then, you can unwrap and reassemble, or add additional flowers if they are needed. 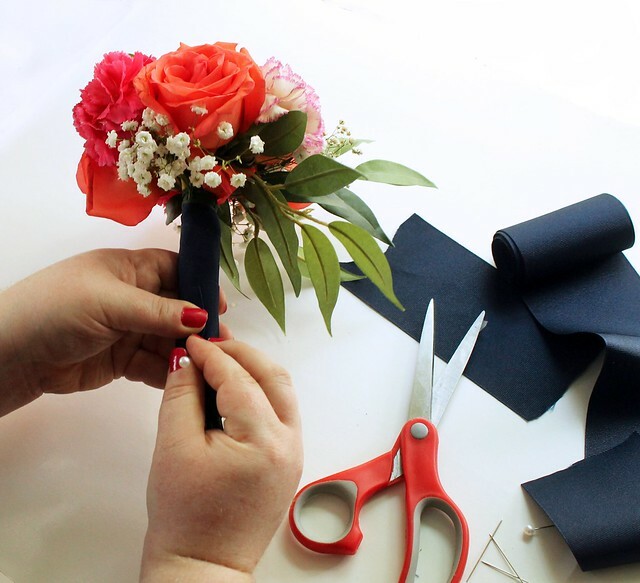 When you have filled out the head of the bouquet to the point where you are satisfied, use the floral tape once more to begin tightly taping the stems together. Start, again, an inch or so below the heads of the flowers and wrap tightly, overlapping the tape, until you’ve reached approximately 2 inches above where you want the stems of the bouquet to end once you are prepared to cut them. For some reason, filler is my favorite part of creating a bouquet. I think it’s because of how it takes an already beautiful bouquet to a completely different level, but also because there’s so much you can consider using to add height and texture. As mentioned earlier, I used some artificial options – a spray of bay leaves and a stem of faux white berries – but also incorporated traditional baby’s breath because it’s just so dainty. Consider overbuying on the filler, choosing lots of different varieties, and then experiment once your bouquet is in-hand. You can’t know for sure what kinds of leaves, sprays, or baubles, your bouquet will benefit from until you have everything in front of you. Filler is an opportunity to really add a little extra beauty that is specific to your tastes and aesthetic. 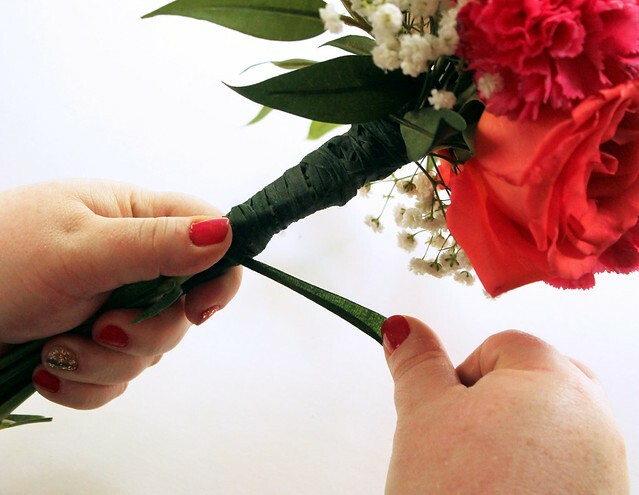 Depending on the length of your filler, you may be able to just nestle it between the blooms, as desired, but if the pieces are longer, or fall more on the outside of your bouquet, you may need to, once more, tape the length of the bouquet handle from one inch below the flower heads to 2 inches above where you will trim the stems. If you’re concerned about filler falling out, you can always add a drop of hot glue to the end before nestling it down into the head of the bouquet. The bouquet head gets all the glory, but truth is that the handle can also be really gorgeous and eye-catching too. For both Charlotte’s bouquet and this re-creation here, I used a thick navy grosgrain ribbon and pearlized pins for a clean, classic finish. You can use any combination of ribbons, laces, twines, etc. that you can think of, so long as you can easily cover the floral tape and find a way to inconspicuously secure the ends. With this bouquet, I wrapped the ribbon tightly over all of the visible floral tape. When I reached the end of wrapping, I cut the ribbon about a half inch too long and folded it under, creating a finished edge, stretched it as far around the handle as it would go, and held it firmly against the handle with my thumb. Using my other hand, I pinned into the fold and then into the stems, angling the pin upward into the handle so that it was securely fastened and safely ensconced in the handle, free from poking through to the other side and injuring someone. I proceeded to do this with several other pins, equal distance from one another, up the length of the bouquet handle. Of course, if pearlized pins are not your style or you’re using a twine or something similar, you could always just hot glue the end and tuck it beneath an area where the handle is wrapped. Last, but not least, trim your stems straight across about two inches from the bottom edge of the handle wrapping. Handle length is entirely personal and, fortunately, something you can customize. Just remember to err on the side of caution and trim less before more. No one wants a stumpy bouquet! When finished, place your bouquet in enough water to submerge the ends, but not wet the wrapped handle (see tips below regarding flower food). Bouquets can be kept overnight in the refrigerator if made the day before or left in there to keep cool if made the day of the event. Before doing so, verify that the flowers you’re using can withstand the coolness of a refrigerator, though, and are not a variety that will wilt in lower temperatures. When selecting flowers, consider sturdier blooms for the bulk, nestling more delicate ones inside the bouquet. For the DIY bouquet maker, erring on the side of stronger, less delicate flowers, will allow more room for rearranging. 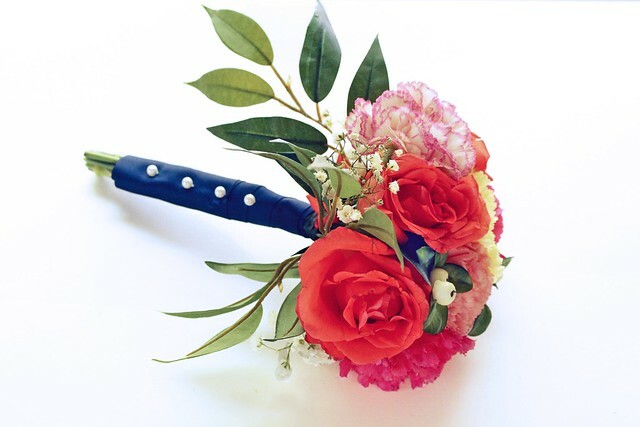 Finding flowers that are easily accessible and financially within your means are key parts to DIY-ing your bouquet. Google around your area for wholesale flower markets, many of which are open to the public, and also start scouting friends with Costco memberships. Yes, Costco! Believe it or not, they have gorgeous fresh flowers and at really reasonable prices – $16 for 2 dozen roses? Boom. Also check out markets that fancy themselves more “gourmet”-type establishments – Whole Foods, Trader Joe’s, Kowalski’s, if you’re in the Twin Cities, are all examples. They always have fresh, beautiful flowers available and, often, a wider variety compared to a standard grocery store. Remember that you can always supplement with artificial pieces. I’m not suggesting making a silk flower bouquet, but filler, embellishment sprays, and leaves can be hard to find if you’re working the grocery store circuit for your bouquet. Check out local craft stores a week ahead of time and stock up on all kinds of potential. Save your receipt so that you can return the pieces you don’t use. Use Pinterest as inspiration ahead of time and gather ideas there for flowers that work well together and bouquet handle designs that match your tastes. Print pictures, or save images to your phone, and take them with you when looking for flowers or materials from the craft store. Give yourself plenty of time. This is a new endeavor and while it’s really not very difficult, it requires patience, and deftness of hand; rushing through will end in broken stems and petals askew. Think the whole process will take you 2 hours? Block off 3-4 to be safe. No one wants to have to rush out the door to the ceremony, leaving their kitchen strewn with debris. Pay extra close attention to pets while you’re creating your bouquet. Dogs and cats gravitate toward crunchy, fresh flora, so they may be circling beneath you like sharks or waiting for you to turn your back in order to steal a taste. Because plants and flowers can be really harmful to pets, consider keeping them in another room if possible until you are done with the bouquet and clean-up or enlist a friend or partner to keep their eyes peeled. A bouquet can last well over a week if kept fresh with water and nutrients after the ceremony. Cut the stems on a 45 degree angle under water and then return them to a vase of water that has been fortified with the packets of flower food that come with loose flowers or make your own concoction by diluting half a teaspoon of bleach and half a tablespoon of granulated sugar into a half gallon of room temperature water. The bleach keeps bacteria down (the #1 cause of early flower death) and the sugar feeds the flowers. Keep this mixture on hand and empty, rinse, and refill the vase with new solution every day. Keep flowers in a cool place that receives indirect sunlight and that is far away from fruit, which releases ethylene gases and can cause flowers to shrivel up early. Transporting a bouquet to a wedding venue can prove a challenge. Creating a stable holder, though, takes just a few minutes. Find a box that is wider than the bouquet (for stability), but that is still easy to carry. Next, seek out a jar that is nearly the same height as the box, but no shorter than an inch below, or longer than an inch above, it. You will want a jar that is at least 4 inches wide so that the base is not too narrow to support the top-heavy head of the bouquet. Wrap the mason jar with brown paper or newspaper in order to give it some padding and tape well. Place the mason jar in the center of the open box and fill all open space around it with filler or any kind – again, newspaper works well here. Fill it tightly so that the jar cannot slide around. Close the lids of the box and tape shut, then cut out a square around the mouth of the jar. If the jar is slightly taller than the box, cut the square before putting the mason jar in the box and taping down the lid. Fill the mason jar with water and flower food solution and insert bouquet. Before leaving, loosely wrap a plastic bag around the head of the bouquet to keep it clean. Check out the quick photos I took with my phone for a better idea of how to efficiently transport the bouquet – photo 1, photo 2, photo 3, photo 4.